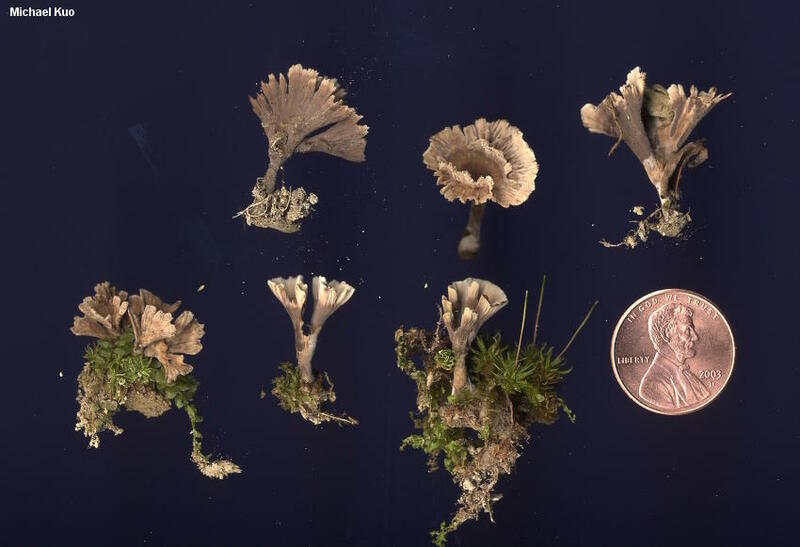 Thelephora multipartita looks to the naked eye more or less like many other Thelephora species: it is a small, dark, fan-shaped, coral-like mushroom featuring multiple branches that often flatten out with maturity. 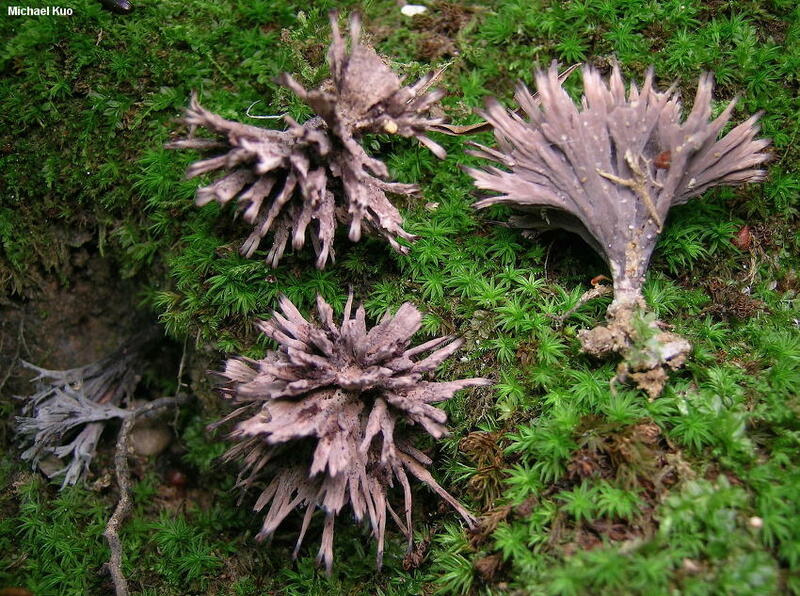 The species hangs out primarily under hardwoods, doesn't feature a notable odor, has relatively small spores, and does not blue (much) in KOH mounts. 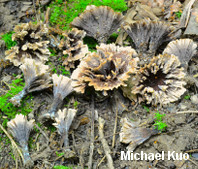 These features, along with the fact that the fan-shaped structures of its cap tend to split apart, will help to separate Thelephora multipartita from most look-alikes. 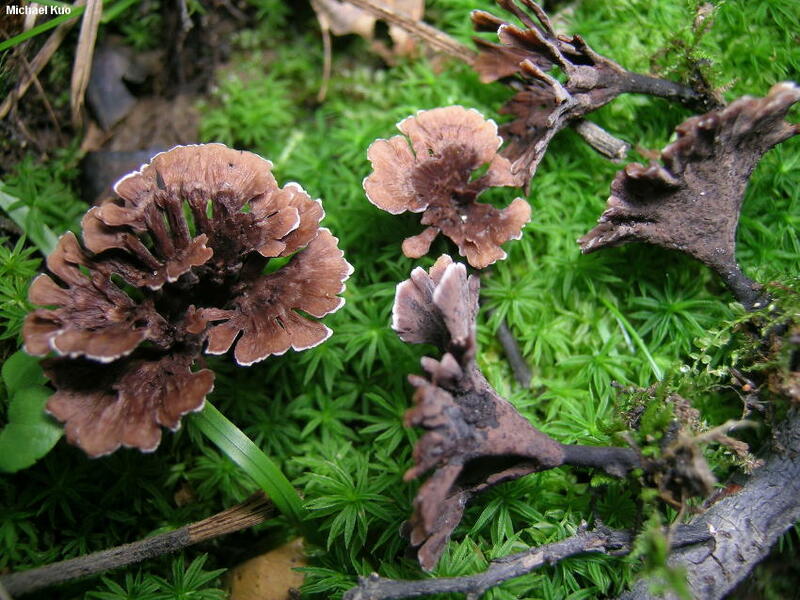 Thelephora anthocephala is very similar, however, and also associates with hardwoods; its larger spores are the best feature for separating it. 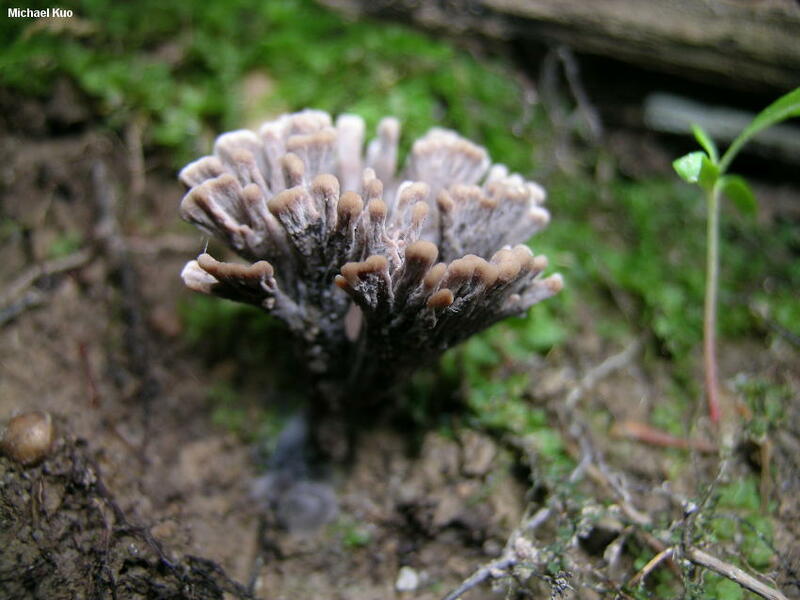 Thelephora species are currently defined on the basis of species concepts from the heyday of micro-morphology (primarily Corner, 1968). The few DNA studies that have been focused on the genus at the species-level (e.g. Ramírez-López et al., 2015) reveal the potential for hidden species and significant variability in morphological features within species in the genus. Ecology: Mycorrhizal with oaks and other hardwoods--and perhaps, occasionally, with conifers; growing alone, gregariously, or in small clusters on the ground in soil or in moss; late spring through fall (and over winter in warmer climates); widely distributed in North America. The illustrated and described collections are from Illinois. 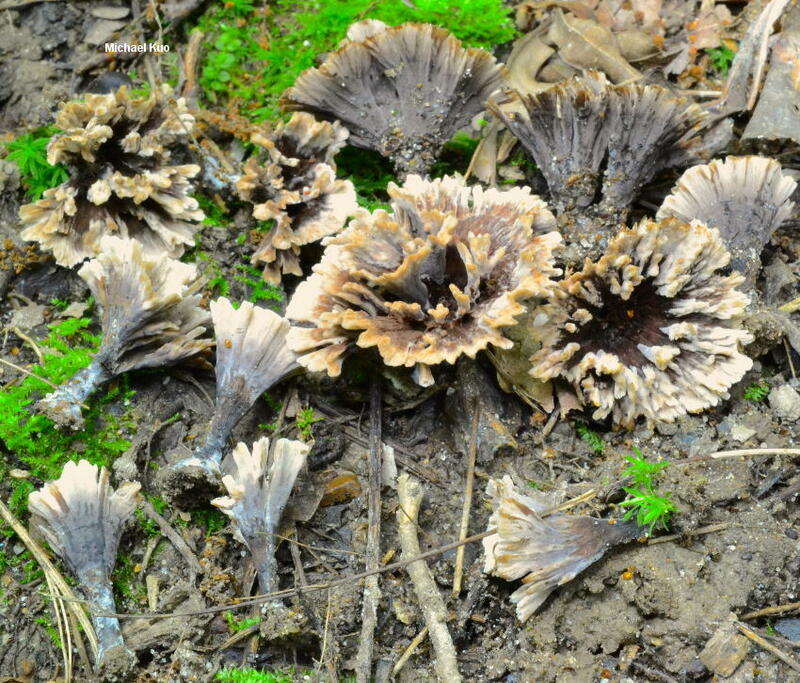 Fruiting Body: Quite variable, but generally a vase-shaped structure 2-4 cm high, with a short stem and a head that develops into a rosette or fan. Head: At first a simple vase-shaped, inverted cone; the inner wall extending additional surfaces with development, with additional "vases" arising to form a rosette-like structure 2-4 cm across; individual components often beginning as cylindric or flattened branches (or sometimes with acute, sharpened apices) that become more flattened with development and often separate radially; outer (lower) surfaces bald, black to dark gray, lilac gray, or brownish, paler at the margin, sometimes becoming wrinkled and/or pimply; inner (upper) surfaces gray to brown, paler at the margin, radially wrinkled and finely fibrillose. Stem: Confluent with outer surface of head; 0.5-2 cm high; 2-3 mm thick; tough; dark gray to black. Flesh: Stringy and very tough; gray to grayish brown. Odor: Not distinctive, or occasionally slightly foul. Chemical Reactions: KOH instantly black on all surfaces and flesh. Spore Print: I have not documented the spore print; probably brown. 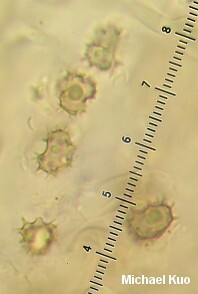 Microscopic Features: Spores 6-8 x 4-6 µ (excluding ornamentation); angular and lobed; covered with spines that extend 0.5-1.5 µ; ochraceous to brownish in KOH. Basidia 2- and 4-sterigmate; 50-70 x 7-10 µ; clavate to widely clavate; basally clamped. Subhymenium sometimes bluing faintly in KOH. 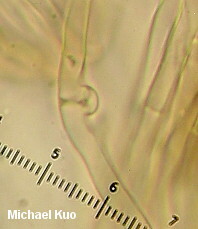 Tramal hyphae cylindric; 3-5 µ wide; walls smooth and hyaline to brownish in KOH; often clamped at septa. REFERENCES: Schweinitz, 1828 in Fries. (Saccardo, 1888; Corner, 1968; Stalpers, 1993.) Herb. Kuo 06030402, 08050306, 07030703, 06180802, 06280803, 06161101, 06121304.